Do you feel you should be using mediums? You’ve probably brought a couple and had a play around, but are you using the right ones? Or is the overuse of mediums doing more harm than good? Acrylic mediums can change the consistency of acrylic paint and allow you more flexibility and creative freedom than any other type of paint. The trick is to use the right ones for the right situation. What is the difference between gels & mediums? Gels are usually used thickly, to keep shapes and add texture. The name is often descriptive of the consistency, binder and lustre finish. The name doesn’t mean that a soft gel will have a soft finish when it has dried. It just means it has a softer consistency, i.e: thinner consistency, it is a bit misleading. If you think of them in cooking terms mediums are like pouring cream, gels can range from double cream to clotted cream! Consistency: Gels range from soft to extra heavy depending on the finish you are after. Lustre: Usually you will have a matte, semi-gloss and gloss finish. Transparency: Glazing liquid can create thin, translucent paint films – ideal for classical painting techniques such as glazing. Gluing/Laminating: Soft Gel Gloss can be used as a glue substitute for collage effects. Paint film: Creating a layer of paint than ‘holds together’, if too watery an acrylic paint film can often not hold in a thin layer it can separate out. Using a medium, such as glazing medium, you can work with thin layers that don’t run, but still have a glass like finish. Cost: By using a medium to extend the paint you can make the paints go further. Adding Texture: Instead of using thick paint, you can create texture with a gel and paint on top. Good question, some manufacturers have a huge selection of mediums which can often be overwhelming to choose from, so often you just plum for one, a random choice on instinct and this doesn’t achieve the results you want, so you don’t try any at all. I’m very keen on trying to keep your painting as simple as possible when you first start because the less you have to worry about technically, the more time you can actually get painting. I use Soft Gel Gloss & Glazing Liquid Gloss on 90% of my acrylic paintings. The Glazing Liquid Gloss is used to help blend edges and achieve very thin glazes when working at an easel. Pro tip: I use the gloss version of the glazing liquid because on semi-gloss and matte versions, the matting agent contained within the medium can sometimes cause a milky finish, especially on very dark, black areas of a painting. Gels are made from the binder that is used in the creation of acrylic paints – an acrylic polymer. A gel contains: binder (acrylic polymer) so is essentially a colourless paint. They come in a variety of textures and consistencies that can be combined with your paint to manipulate the effects you are after. One of the primary roles of gels and mediums is to extend the paint for economical reasons. By using artist quality acrylics mixed with a gel (Regular gel or Soft gel would work best), you can effectively create your own ‘home-made’ student range. A note of caution: although the consistency would be similar to the artist range, the way the paint behaves and feels on the brush is slightly different so I tend to use it like this only for my under-painting. When mixing the paint with gels, there are no limitations to the amount of gel you can add, all that will happen is the paint mixture will become less and less opaque. This would be the same if you diluted the paint with water of course, but with water, it would make the consistency thinner whereas with the gel you can maintain the heavy body of the paint. I prefer to slightly dilute my paints when I’m blocking in local colours to a painting, so I would use Soft gel gloss for this. This thins the paint consistency from the tube (using GOLDEN heavy body acrylics) yet creates the perfect consistency for my initial ‘lay in’ stage of the painting. It’s like being your very own mini paint manufacturer! Pro tip: Archivally the acrylic mediums are very safe, with no discolouration as opposed to oil paint where the more oil added, the slower the drying time and higher the likelihood of the painting to discolour over time – due to the extra quantity of oil in the paint film. Are you a painter or a pourer? Different gels have different chemical makeups which affect the way they mix with your paint. If you want the paint to still feel like paint, retain brushstrokes, stay in peaks or texture then a gel with what is technically called a short rheology would be perfect. The ‘rheology thickener’ helps the medium to stay in a fixed shape rather than level out. So if you want to create a palette knife textural feel to a piece, using an ‘Extra Heavy Body Gel’ would create stiff peaks that hold in a shape. Other gels have been specifically designed to level out and will never be able to stay in a fixed shape. Clear Tar Gel, as the name suggests, has a very stringy, gloopy texture much like treacle. (sorry about another baking analogy) this is called a long rheology. So even though 2 gels could have the same thickness and consistency (often referred to as viscosity) they would behave very differently depending on if a ‘rheology thickener’ had been added. Self-Leveling Clear Gel and Soft Gel are the same consistency, the Self Leveling Gel will be great for creating a painting where you don’t want to see any visible brush-marks whereas the Soft Gel will help to achieve a more textural effect. Please note: Clear Tar Gel and Self Leveling Gel are the exceptions to the Gel rule of adding texture and viscosity to your acrylic paint. Golden produce several specialist Acrylic Gels that add rough or granular texture varying from Pumice Gel that can be great for beach scenes to molding paste that is brilliant for building surfaces up, it can even be carved into! Liquid Mediums, such as Acrylic Glazing liquid gloss are great for increasing the working time of Acrylics and make blending that little bit easier. Want to learn more about how to use gels in your acrylic paintings? You should have a look at my Absolute Beginners Acrylic Painting Course, teaching you classical painting techniques with the modern medium of acrylics. For my art project i want to create a painting of autumn trees and leaves, yet i want the leaves and ground to be create a texture and stand out from the rest of the peice. is this possible to do with a tar gel? and if so, how should it be applied? It might be a bit tricky with the tar gel because it has been specifically designed to level out and will never be able to stay in a fixed, hard shape. You would be better using a heavy gel which can hold peaks and shapes. You might also look at the pumice gels which will add a texture that could create some nice effects for the ground. What a shame! I don’t personally know of anyway to ‘reactivate a gel’ some of the more recent ‘open acrylics’ from Golden can be worked into again once they are dry but most of the gels and mediums dry by evaporation so as soon as they have been exposed to the air and have dried hard can’t be diluted again. I’m currently taking adult education classes in painting and drawing, and am doing quite a lot of painting at home now. I’ve recently embarked on a project to paint in acrylics a series of seascapes – crashing waves on the beach, stormy skies, that sort of thing. I’m finding that I’m having trouble making the white colours really ‘pop’. I’m using Titanium white but find that when I add it to the painting, in the whitest parts of the sea foam, or the clouds, it’s not really coming out as white as I would like. I mentioned this briefly to my tutor this week and she suggested a gel medium but, having read your article, I have no idea if (a) this is the solution or (b) which one to use? Do you have any suggestions? Thanks for dropping by, the Gel medium won’t make a difference to the ‘white’ of your white. What it will do is add texture to your piece but won’t make the white ‘pop’. Are you using artist quality white? As using student quality is much more tranlucent and it will make it harder for you to achieve that ‘pure white’ effect. 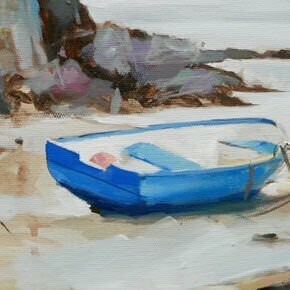 An investment in artist quality white is one of the best things you can do to instantly improve your acrylic paintings. Quick question, I was just at the art store and they told me that I couldn’t paint over leveling gel, that the paint would not bind? is this true? could I sand and gesso before? Yeah, it would be worth giving it a light sand, then Gesso it, then the paint has something to adhere to. The only draw back is the paint might slide around a bit as you have lost the ‘tooth’ of the canvas. I’ve written a post about ‘Painting over a painting, the pros and cons‘ – it might be worth a read. Thanks for this great post, Will. I am working on collages that are made from card stock photos that are torn and glued, and then I apply some paint on parts of the collage. Someone suggested that i use a palette knife and apply a gel coating on top of the entire surface when I’m done. I can’t figure out, though, what the purpose of that would be? You can use a gel coating to bring all the elements together in a unified film, so it is just for aesthetic reasons than anything else. I need to know what is a good sealer for art journal pages… I will be using acrylic paints, water colors, and ink and stamps…. I am overwhelmed with all the products out there… Thanks for your help. Have you ever tried a spray varnish? Winsor & Newton, along with other manufacturers, make an ‘Artist all purpose Spray Varnish’ that can be applied to all sorts of craft work including paper and acrylics, it is non-removable but the benefits are, it be applied in fine layers (so it doesn’t get too wet) and it’s more controllable. This should help prevent pages sticking together (a gloss finish would be the most suitable for non stickiness but it depends on the aesthetic finish you’re after, it comes in a matt finish also. Hi,i have question about the soft gel gloss.Is it ok if i wet sand it?Thanks in advance! Personally I wouldn’t sand it, it would ruin the finish and take off the gloss, but it depends why you want to sand it? There won’t be any harm in sanding it if it’s to create a rough texture for your painting. Is it ok if I use soft gel instead of glazing liquid? Thanks for all the extremely helpful lessons! You can use Soft Gel Gloss to extend the paint and the drying time slightly. The glazing liquid just has a more liquid consistency and is a bit more ‘gluey’, so feels like it has a bit more hold in thinner layers. Hi, I am making a collage for my husband for our 10 year anniversary, I am using regular pictures, which kind of acrylic gel do you recommend? 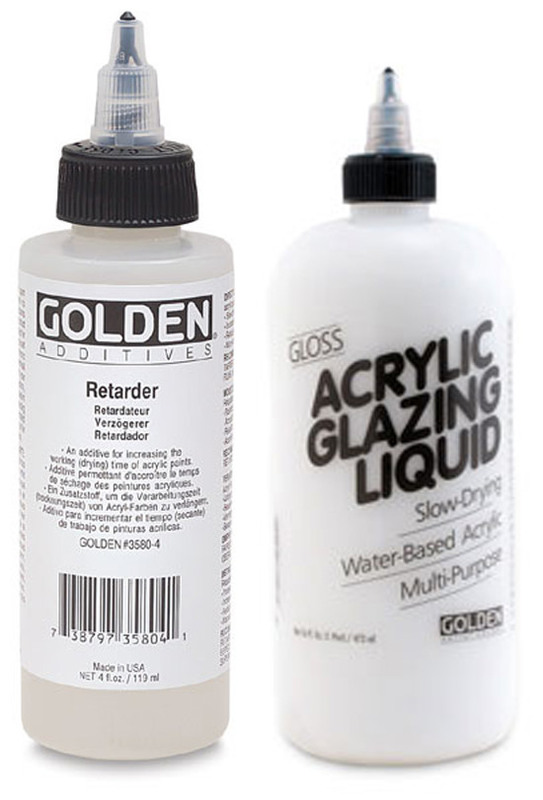 The acrylic medium that can also be used to great effect for collage techniques is “Golden – Soft Gel Gloss”. Instead of diluting it with water you use it neat, straight from the tub. This will be perfect to seal the pictures as well, it really is a magic medium! Either paint both sides of the image you want to collage with the medium and attach to the surface you’re working on or cover the surface with a coat of medium, stick your image on, wait for it to dry and then cover with another layer of medium to seal it. It is surprisingly sticky and is also available as a Matte medium which might give a better look for your anniversary present. The only thing to be careful of is buckling. If the paper is very thin you might get slight buckling. Try it with a test piece first. To increase the working time of the acrylic paint, it stays wetter for longer. Before painting on canvas, is there anything we have to apply in the canvas board? Hi! I have been using acrylics to paint on glass. Up to this point I have been using mod podge to “seal” the paint, but am worried that this will wear off over time. On some pieces I have used the mod podge and then a clear acrylic sealant (aerosol), but it doesn’t dry clear and gives the glass a frosted look that I don’t like. My dad bought me a jar of Windsor & Newton’s Artists’ Acrylic Gloss Medium. I added a little bit to my paint for a project that I was working on and like the results I got. The paint was easier to work with and had a raised feel to it. I didn’t use mod podge at all. My question is, if I mix this into my paint when painting on glass do I need to seal it somehow? I do a lot of wine glasses. I don’t bake them. I also want people to be able to get them wet and not have the design wash off. Help! Mixing the Gloss medium in with the paint is just a way of extending the paint (paint is a mix of pigment and acrylic polymer – the gloss medium is type of acrylic polymer) it won’t add any extra sealant qualities to the paint. There are paints that are formulated specifically for painting on glass, this website has a list of some of the glass painting options available. I have never used any kind of gel medium before. I am wanting to add texture to my canvas and then paint over it. Can you do this and which gel medium would I use? I paint with acrylic paints. Sorry this all foreign to me , so would appreciate any advice. Thanks! Hi Darlene, try a heavy , or extra heavy gel, this will give you the most texture and peaks. Just mix it in with your acrylics, or paint it onto the canvas and then paint your acrylics over the top. you could also use a coarse pumice gel which will add texture, but won’t hold peaks aswell. So I’m currently working on two paintings right now. One painting I want is of a glass bottle with an object inside. I want to paint the bottle green, translucent and with a slight shine/gloss so that you can still see the contents of the bottle. What type of medium would you suggest? Painting number two is of a mountain and snow. I really want the snow and rocks to have a really rough texture with distinct peaks. What type of gel would suggest? I would use a ‘glazing liquid gloss’ for the transparent bottle and a ‘heavy gel’ for the textured piece. I want to start journaling. I would like to be able to glue paper/magazine type paper to 180 lb hot press paper and seal it. What would be the best all in one medium? Also, If I want to use a Liquitex Paint Marker or acrylic paint on top of the paper would I seal first or after using the marker or paint? It is surprisingly sticky and is also available as a Matte medium. I would seal it after using the marker or paint, but the best thing to do is try a few small test pieces, sampling different layers of paper, paint and medium in different orders, to be 100% sure it’s the look you want – before making your journal. I just stumbled upon your Youtube channel and .com, I may have lost track (in the plethora of good information here) and missed the answer to my question..
Is there a difference between fluid acrylics vs. acrylic paint + glazing medium? Is there a difference between fluid acrylics vs acrylic paint + glazing medium? Yes, the fluid acrylic will have a greater pigment load, so will appear brighter and more saturated in thin applications. Thinned with glazing medium standard acrylic will be less powerful, just like if you were thinning them with water. Thanks, Will. That helps a bunch. I want my Golden Acrylics to look flatter on a painting I am about to start. It has large areas of many Grays / Blacks / dark tones and I don’t want to loose the pigment variation but I do want the finish to be uniform. My first attempts using Matte Medium mixed in 4:1 (Paint:Medium) look OK but not “Flat”. Should I be using a varnish / Matte Medium coat at the end or should I try and source the Super Loaded Matter Medium (or equivalent?). I would go for a Matte varnish after the painting is finished. This is the easiest way to achieve a ‘Flat’ look. It might take a couple of coats, but the Matte Varnish will always give you a more consistent finish across your painting. Thanks for much for the response. Just working through the website and learning an awful lot! Very helpful and have abandoned my experiments in achieving consistent sheen across colours. Would you go for Varnish above the Medium as a top coat? I see people use both and both can “whiten” the colours; because many colours are similar I don’t want to lose to much definition. Do you recommend the spray or the brush on products (sorry for many questions; its these “technical” aspects of acyrilics above my regular medium that confuse me!). Hi Will, I would always favour a Varnish, it is the white matting agent in the product that can sometimes give the appearance of a cloud, or misting, but this is only really noticeable in very dark colours. Application wise, if the surface is reasonable smooth brush application can work well. Spray can give you the most even finish with no visible brush marks but you’ll have more loss of product, it’s a touch more expensive. Also, make sure you shake the spray more than you think so it it really well mixed. The best way is to try both and see which finish you personally prefer. It would almost seem she had to do it after she was had completed the painting as the birds and trees don’t ripple around the ridges. Do you just use a transparent gel after you are done and then scrape with a multiple ridged tool? If so what gel would you recommend? Clear of course, but consistency and finish would be? I appreciate your help! So glad I came across your site! It’s hard for me to say 100% but it looks like a regular or heavy gel, applied with a stiff brush. To be completely sure you can contact Louise direct here. Thanks Will for the quick reply and the link to Golden. just watched the videos they provide. I also sent Louise an email. Not sure why I didn’t think of that in the first place! Looking forward to wandering around your site some more. Good one Annette, enjoy exploring the site. I am a beginner and just started using soft gel matte, it says it is cancer causing, should I be using a mask and cover my hands? wash after working with materials. Is there any cheaper substitute for the Golden Clear Tar Gel / Self leveling clear gel ? It is a bit expensive for experimenting in large quantity in the artwork … so I wonder if there is any other brands or material that resemble their property. The only other self levelling gel I’m aware of is by Tri-Art, but that works out more expensive than the Golden versions. many of us and for this amazing website. glazing can I use a spray varnish? Nice to hear from you, yes, you can apply a glaze over an area of the painting and then work over the top with thicker paint. Because acrylics dry so quick you can keep on building up the painting using this method. When your painting is finished it is best to apply an isolation coat first, and then you can apply a spray varnish. Good luck with your sunset! I am new to acrylic. I wanted to know if I could write on the painting while it is still wet and have the words blend into an image but still be readable . Is there good technique for that? Thank you very much. The best way to achieve the kind of images/effects you’re after is to use image transfer techniques. This way you can combine painted surface with printed text. Here’s a video that goes through the acrylic image transfer process. Hi Will…I’m new to this acrylic painting gig but I’m very intrigued. You could call me a nap time painter because when my youngest is napping is when I have the time and energy. I just started playing with the golden clear tar gel and have been using it to cover a painting to make a shiny coating. i put two layers on (waited 24 hrs) in between) and noticed it’s not even and feels lumpy. Is this what the final product should look like or did I not wait long enough between applications? I applied it with a 4″ wide paint brush, fyi. Nap time painter, great idea! The tar gel is usually best applied as a drip or blob and then left to its own devices to move around/settle on the canvas. It has self levelling properties so should find its own level. What is the effect you are trying to achieve? I just finished a painting, and used a really coarse salt to add texture, but a lot of the salt is loosely sitting on the canvas. I want to keep it for texture. Would a self leveling gel be the best method to adhere the salt to the canvas? If so, would I be able to do any glazing on top of the gel afterwards? Thanks in advance for your advice! Much appreciated. Hi Andrea, not sure how much of the salt would stay, but a clear self levelling gel would hold it. Just make a small test sample and pour some on. For adding texture with acrylics the ‘Coarse Pumice’ has a salt like texture, but will hold in shape and mix with acrylics. Thanks for this interesting article. However, I’m still confused! I want to create a splatter effect in which the splattered paint has a stringy web-like consistency, and retains texture. I’ve been trying an acrylic matte medium, but this doesn’t spread enough, and I’ve had to use a palette knife, which doesn’t really produce the desired effect. Diluting the medium too much stops it from drying at all! Is the answer just to use gel, rather than ‘medium’? Hi Ed, you would need to use something like the ‘acrylic tar gel’ this will give that stringy effect you’re after. Many thanks for this Will. I’ll give it a go. I know I’m very late to the threat here, but I tried string gel/tar gel and it’s great for dribbling but horrible for splatter since it’s too thick. I, too, wish I could find the right medium for long, splash-like splatters. Watering down my paint doesn’t seem to be a good approach – it becomes too transparent. I guess I will try fluid medium since I’m out of other ideas at this point. Stumbled upon your site the other day and I love it! Thank you so much for all of your tips and pointers! I hope to be able to take some of your courses soon! Quick question: What are your thoughts on Liquitex? Winsor & Newton are a great brand, I use them in my acrylics as well. The Liquitex is just a touch more glossy, but works in exactly the same way. I have been working on my first acrylic for a year. I’ve been trying to even out the surface with the gel. Is it possible to use too many layers? There are bumpy areas. I love the transparency. It is glossy too–was that a wrong choice? 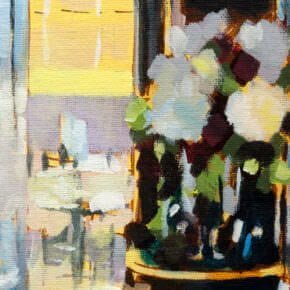 Hi Sharon, most gels will be glossy (unless of course they are a matte gel) you can’t really have too many layers, but some thicker gels are more suited to building up layers in thicker paintings, such as heavy gels. I am wondering if you can advise me on how to apply diamond dust to a very large print of Elizabeth Taylor on Canvas. Would I apply a soft gel mixed with the diamond dust? Hi Karen, mixing in with soft gel would work, just test a small piece first to see if it is the effect you’re after. I came across to your site by chance and glad I did it. I am trying to attempt to do a mixed media painting for the first time and planning to add some Fimo Soft baked clay for some of the objects I have in mind. Am I right to use a texture paste for the sticking part? Or do I need to mix the texture paste with something so the clay will stay on more securely? Will do it on stretched canvas with acrylic paints. To attach the Fimo to your canvas glue is going to be your best friend. You could also experiment with a ‘Hard Molding Paste’, this will dry to a hard surface but can also be carved into after it has dried. This video shows a demonstration of the different qualities of the Molding Pastes. WOW! I AM LEARNING SO MUCH FROM YOUR DEMOS ON GOLDEN MEDIUMS. WAS CONFUSED AT FIRST WHEN I WENT TO GOLDEN’S WEBSITE. SO MANY DIFFERENT KINDS! YIKES! THE OPEN ACRYLIC GEL I WANT TO TRY AND THE GLAZING LIQUID AS I HOPE IT MIGHT ASSIST ME IN LEARNING HOW TO BLEND BETTER. I HAVE THE SOFT GEL AND JUST STARTED TO TRY IT. LOVE IT HOW IT MIXES IN WITH THE ACRYLICS. VERY EASY TO WORK WITH. NOW IF I COULD ONLY DRAW AND PAINT LIKE YOU, I MOSTLY DO MIXED MEDIA AND LOVE DOING ALTERED BOOKS. ONE OF MY FAVORITE PAINTERS WAS REMBRANDT, I SAW ONE OF HIS PAINTINGS YEARS AGO AND WAS AMAZED AT HOW REAL ONE OF HIS CLOSE- UP FACIAL PORTRAITS WAS. DON’T REMEMBER THE NAME, IT WAS A MAN’S FACE AND LOOKED SO REAL LIKE IT COULD STEP OUT OF THE PICTURE FRAME. ANYWAYS, THANK YOU FOR ALL YOUR HELP ON PAINTING. I AM NEW TO YOUR WEBSITE AND AM ENJOYING IT IMMENSELY. Pleased to hear the article helped Sheryl, enjoy exploring the site. JUST REMEMBERED THE OTHER PAINTINGS THAT I AM IN AWE OF ARE ALL THE IMPRESSIONISTS PAINTERS. Hello Will, I am so happy I found your site! your knowledge is a tremendous help in wading through the plethora of gels, mediums and other additives. Saves so much frustration, time and also money. My question is about Acrylic Flow Enhancer. What does it do, when would you use it? Some other artist on the web says that not using it is the biggest mistake acrylic painters make. (!) Would you please help with this? Hi Deborah, pleased you’ve been enjoying the tutorials. Acrylic flow release breaks down the surface tension of the acrylic and creates really nice staining effects. A few drops in your paint can aid with a more flowing line if you’re painting in more of a watercolour style. Here is a video demonstrating the acrylic flow release on a raw canvas. Hi! Fantastic article! and page! I’m trying to make a sculpture with wax and trap tinier objects inside the wax however, it’s not as clear as I’d like it to be and the objects don’t show inside! Do you have any idea if gels can be made into hard molds in the shape of a ball?? or would you use something else? Abena, the best thing to use for clear spheres would be a resin, poured in once you have created a mould, you might find this video of interest that goes through the process of creating a resin sphere. CURIOUS TO KNOW MORE ABOUT RESIN? HOW TO MIX WITH ACRYLICS? AND IDEAS AND EXAMPLES ON BEST WAY TO USE. Hi Cheryl, you wouldn’t mix the resin with the acrylics, its just handy for embedding objects in clear spheres. Hi, i am new to here and to ‘art’. I want to use glass jars and give a dipped, dripped effect. Which mediums, paints, sealants would be best?? I’ve been reading a variety of answers to my question and I would like to hear the right one… I was just at Michael’s searching for clear gel/glosses to use as a finish over oil paintings. I’m using Golden products, and these particular Gels were amongst the oil materials so I assumed they could be used as an oil “finish,” not necessarily a medium (which was not my intention anyways). Yes, I’ve read oil and acrylic gels do NOT mix. However, if my oil is fully dry, is there any harm (furthermore, will it “enhance”) if I sparingly use the gel over top? I got Glass Bead Gel (which I think would look cool over a large abstract oil painting I did – basically a gradient from blue to yellow. I also bought Regular Gel. I’d love to throw either on top to make it look more textured, glossy, and professional. Is this a “no-no”? Please advise. Thanks so much! Hi Donna, an acrylic gel (or acrylic paint) over an oil painting is a professional no-no. 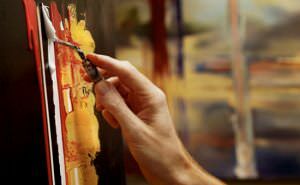 Traditional oil paints dry by oxidization, when the oil reacts with oxygen in the air and even though they may feel dry to the touch the ‘curing process’ can take many months if not years depending on the thickness of the paint application. You can read more about varnishing an oil painting here. I KNOW WILL ANSWERED YOUR QUESTION, HAVE TO TELL YOU THO, I AM A NEWBIE TO OIL, AND I LOVE IT BUT IT IS DRIVING ME NUTS WAITING FOR IT TO DRY. I AM USED TO ACRYLICS WHICH DRY PRACTICALLY INSTANTLY. I HAVE BEEN EXPERIMENTING WITH GOLDEN PRODUCTS LATELY AND TRIED THE GLASS BEAD GEL AND LOVED IT! I DO MOSTLY MIXED MEDIA AND ALTERED BOOKS. HAVE YOU EXPERIMENTED WITH THE GLASS BEAD GEL YET? ANY TIPS OUT THERE HOW TO GET OIL TO DRY FASTER? CAN YOU USE A HEAT GUN, OR IS THAT A NO-NO ALSO?? I AM SURE WILL WILL LET ME KNOW. HA! HA! Hi Cheryl, the best way to improve the drying time of oils is to mix in a ‘Alykd medium’ such as Liquin from Winsor & Newton. This can help to increase the drying time by 50%. THANKS WILL, I JUST BOUGHT SOME OF THE LIQUIN AND IT DOES HELP DRY FASTER, I JUST GET IMPATIENT. IT DRIES SO MUCH MORE SLOWLY THAN ACRYLIC. WILL, DO U EVER PAINT WITH GOUACHE? I LOVE THE BRIGHT COLORS, AND READ THAT IT IS SO VERSATILE, THAT U CAN DRY BRUSH? LIKE AN ACRYLIC. I READ THAT ON THE WINSOR & NEWTON WEBSITE. ALSO, THAT U CAN LAYER WITH IT. I LOVE TO EXPERIMENT WITH EVERYTHING. 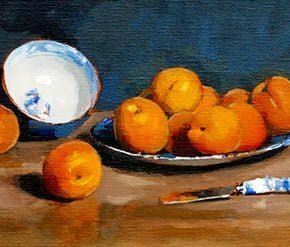 Hi Cheryl, I have worked with Gouache in the past but tend to prefer a more textured, painterly approach of acrylics and oils. Hi Will and Thank you for sharing your knowledge. I am a volume framer not an artist. I have been experimenting with Liquitex gel medium. Applied with a stiff brush thus giving a paper print the illusion of a painting. The Matt gels have been too cloudy (diminishing the artists’ work) and the Gloss is too shiny (at some angles you cant even see the artwork). I have been trying to create a mixture of the two but no luck. Any suggestions? I would go for a satin giclee varnish, you can get specialist varnishes for giclee prints that hold onto the print really well and will give a nice lustre. In the UK Lion Picture framing do a satin product designed for giclee canvas prints. I need to work with Fluid acrylic, but In India we cannot find one. I do not want to use water to thin my heavy body paint and ruin the quality. Can i use some medium to get the desired effect still keep the strength of the pigment. Is “Airbrush medium” suitable for the purpose? It would be nice if you could suggest some mediums or other workaround to solve the matter. Hi Shishu, using water won’t ruin the quality, it will just dilute the intensity of the pigment. If you use a medium it will keep a more solid consistency, but will still be the same level of intensity as if you dilute with water. Thanks for the very informative site and feedback on the comments section. I have been experimenting with acrylic transfers for the last couple weeks, all black and white from a laser jet printer. Thus far I’ve had good results cutting out the image and applying a thin coat of Omnigel medium texture transfer gel to wood, stone and textures plastic. In all cases I brushed a thin layer of the gel to the area outside the image so the whole thing had a consistent finish. Next I really want to transfer a black and white photo to a motorcycle gas tank I am designing. Do you think this process can work with an automotive base (Acrylic Enamel) and Urethane based clear coat? Also, if it can be done, is it possible to sand or wet sand the whole or outside area to diminish the “lift” of the edge? Any feedback is greatly appreciated.you have already been of great help! Finding your site very helpful so thank you! I am about to start a big commission which involves really large canvas’s that I am having the frames made and the canvas stretched for me. I know I’ll need to prime these but unfortunately actual gesso is quite pricy here in Zambia (if you can get it at all) so wondered if you offered an alternative way of priming my canvas’s before putting on the background color?? Hi Natasha, if you’re working with acrylics you don’t need to use gesso, you can apply the paint straight to the canvas, it will just give you a different effect. I do collage paintings and have always used a liquid medium for my glue. This time I used Mod Podge, just to try it, but now I’m concerned about how to do the final topcoat. I’ve looked high and low on the internet to see if I can use Golden Top Coat. Most comments said to use acrylic polyurethane, but the has no UV protection. I worry there may be some chemical reaction with the Mod Podge! This is a nice paper painting and I don’t want to ruin it. Any comments? Help! Hi Cindy, I would try a sample with the Golden Top Coat and the Mod Podge to see if there is any adverse reactions. I can’t imagine there would be, but I don’t personally use Mod Podge within my works so couldn’t say for sure. It’s always best to test first. I am painting a night sky, and I want to create a distinction between stars and clouds to show that the stars are further away, while also ensuring that they are the focus of the painting. I know I can do this somewhat with colors, but I was wondering if I used a clear coat of semi-gloss between the layer of stars and the layer of clouds, if there would be an effect (and if it would be a good one! )… If you have any advice, I’d appreciate it! What you need to do is apply a thin, transparent glaze (a thin coat of paint) of a dark colour over the furthest starts in the distance. This will tone them down and give the illusion of them being in the distance. I’m finally making the jump into mixed media. Since this is my first time in that arena I was hoping you can give some advice since I enjoy your videos and feel I can trust your opinion. (i normally work with marker, pen/ink, watercolor, oil pastels and digital, haven’t played much with acrylic since college) I would like to create a collage (on canvas) of magazine and newsprint and then paint a semi-transparent image over it. I know I can use gels as a “paste” for the collage onto the canvas; but, my concern is how to paint on top of the collage without it affecting the collaged images. I’m guessing I can clear coat the collage with a gel/medium to protect that image and then go about painting on top of that. Some say it won’t work if I try to paint over the collage’s gel “top coat” as it will act like watercolor on plastic. Others suggest using an airbrush medium on the gel “top coat” instead of a acrylic medium in order to get the translucent effect. Another suggests lightly sanding that “top coat” to get a tooth back for the final image on top. I’m currently out of supplies to try and experiment, so I was wondering what techniques you would suggest before I went out and bought supplies (since I’m embodying the starving artist and all, haha, I need to be very careful what I splurge on). Thanks. I would like to create a collage (on canvas) of magazine and newsprint and then paint a semi-transparent image over it. I would use soft gel gloss (from golden paints) as both your medium and glue. How to paint on top of the collage without it affecting the collaged images. The Soft-gel gloss will form a barrier if you apply a couple of coats onto the collaged images, but you will still be able to paint ontop. In the videos I saw you tried the Open Medium. Does it extend working time with regular acrylics and if so, how much? Could it be used in place of retarder? I often find myself adding a bit more retarder than suggested to extend the working time, and like you said in the videos, water doesn’t work too well when working on canvas for thinning paint out, so I thought Open Medium could be a possible solution to both those problems. Or is there a better alternative? I have considered Open paints alone (haven’t bought anything yet), but I fear they might dry too slow, I prefer slowing them down as needed. Yes, it does extend the drying time of normal acrylics, but it wouldn’t be used in replace of a retarder. You can read some thoughts on OPEN acrylics here. If you add too much retarder it can give the paint a strange texture and feel. Depending on the style of painting you do I often use Acrylic glazing liquid gloss as a medium,as I can add in different quantities to the paint without it changing the feel of the paint drastically. “…but it wouldn’t be used in replace of a retarder.” Does it just not extend it as long? It’s just, I’d imagined mixing with the Open Mediums, possibly the thicker gel one instead of the liquid one you used, would be like mixing the Regular acrylics with unpigmented Open paints, giving you something in between the regular drying time and Open’s depending on the ratio. Or at least, that was my impression from the things I’ve read on Golden’s site. I’ve never worked with any mediums or anything other than retarders (which I want to cut down on). Does the Acrylic glazing liquid gloss slow the drying time at all? Anyways, thank you for the quick reply. Sorry I have so many questions, but I haven’t found many people who’ve worked with such a range of products. It’s also hard to get good art supplies where I live so I like to research my purchases well beforehand. Hi Jim, yes, the Acrylic glazing medium slows down the drying slightly. Hi Caryl, have a read of this article for your varnishing options. thanks for all the great info…i am trying to work with the extra coarse pumice gel and wondered what brush works best..i am making santa beards on corks out of the gel (no comment!) using an inexpensive small brush but doesn’t seem to do the trick adding a nice thick layer. any suggestions? Hi Karen, I would use a palette knife to move the coarse pumice gel around, good luck with your santa beards! Hi Diane, I’ve always had good results with the Golden mediums, you’ll be able to achieve a matte finish. The Golden varnishes and mediums are all manufactured to archival standards. Not sure if you can help me, I am new to painting and not very good so have turned my hand to pouring the paint i use acrylic and have also purchased pouring medium but the mix is to thick and will no run on the canvas what can i use to get it to run?? Hi Lin, if the medium is too thick you just need to add some water to the mix, stir it together and try pouring it again until you get a nice flow. Thanks for that although i did try to add some water but the paint started to mix. it started out as a gold and black painting but ended up as a shine black with very little gold . is there a formula for how much water i mix. Hi Lin, not really , I would just mix us a few ‘tester mixes’ onto a palette, varying and making note of the different amounts of water added and then test these on some paper/canvas. I was wondering what sort of medium or techniques I should use to create a fog effect on a window or mirror, I am primarily working in acrylics. Hi Maria, a thin wash of zinc white would do it. Hi, what is the difference between gloss and matte finish in final result? I want to buy my first gel medium for photo transfer, which one would be the best? Soft, regular or heavy? Gloss or matte? Thanks in advance! The Matte will have a non-reflective surface and the Gloss will be shiny and bring out the saturation in the colours. A regular gel medium will work well for image transfers. I seem to have a bit of a problem. I am late finishing a custom piece of art. This is my first try at painting with Acrylics (Golden) on a Board (Ampersand Gesso board), and it is large (3’x4′) and it’s not going well. The board absorbed the paint as quickly as I put it down, leaving a choppy, chalky appearance. The local art supply store (where I purchased the board) applied an Isolation coat (gloss polymer gel medium). The isolation coat is now dry, and has hot spots, rough areas and is a mess. Here’s where I could really use your help, Will. I’m wondering if I applied paper with a gel medium (decoupage style), if my painting would stick to it. I usually use Golden acrylics, and then add some shading and details with Pastels sealed with a fixative. The subject matter is a whimsical/folk art style landscape, that might add some visual interest with texture even if I completely paint over any designs the paper itself might have. Thoughts, how to, any help at all, please??? Yes, you can use Gel medium as a glue ontop of your painting, it works best if you apply the gel medium to the painting, then apply paper, then apply another coat of medium over the top. This will give a good strong bond to the surface. If you want to apply pastels to the surface you can apply a coat of ‘Acrylic Ground for Pastels’ and then apply the pastel onto that, here’s a video with the pastel ground being applied. Hope this helps Jan and good luck with the painting! can anyone tell me if i can use regular mediums with OPEN acrylics, or do i need to buy mediums that are designed specifically for open acrylic paints. i have used mediums for a long time with regular acrylics, but i’d like to experiment with open acrylics, especially for summer outdoor painting. and of course, i’d like to keep expenses and storage at a minimum. Hi Sharon, yes you can combine the two paints, you don’t need the OPEN mediums, although they will keep them OPEN for longer. You might find this article on OPEN acrylics of interest. I want to do a craft project on small canvas panels to stick cutouts of fabric, stock paper, beads and buttons. Will gel medium matte, glue all those and if so, how long does it take to dry? Or can I just use mod podge for the fabric & paper and tacky gkue or fabri tac for the buttons & beads? Hi Gabi, gel medium can work well for papers and thin fabric but I haven’t personally tried with heavier objects such as buttons and beads. FUNNY U ASK, I JUST USED GOLDEN SOFTGEL (GLOSS) TO GLUE SOME STONES, AND WAS AMAZED AT HOW FAST IT HELD THEM DOWN. IT WORKED BETTER THAN I THOUGHT IT WOULD. WORKS WELL ON BUTTONS ALSO. PROBABLY WOULD WORK WELL ON JUST ABOUT ANYTHING BECAUSE THESE STONES WERE GOOD SIZE BUT THEY WERE FLAT STONES. I AM GOING TO TRY ON SOME ROUND ONES ALSO. ALSO, I GLUED MY STONES DOWN TO CARDSTOCK, I ASSUME CANVAS WOULD WORK TOO. YOU ARE VERY WELCOME WILL. APPRECIATE YOUR QUICK RESPONSES AND YOUR HELP. Hi Ashley, all mediums are usually of a white base, and the inclusion into black can cause a slight greying of the colour, but not too much. You can get lustres from gloss, satin and matte, the other option is to paint the painting with the medium you are using but then apply a final varnish using different gloss/matte finishes. The matte will still make the black appear slightly more grey though because the ‘matting agent’ is usually white. I just finished a textured painting using the crackle paste . I want to strengthen the paste texture and give a protective coating to the acrylic paint. Would Gloss medium work? If not what would work? Hi Vincent, Soft gel gloss applied as an isolation coat would work. I have used gel meduim as a final layer to create a sort of faux encaustic effect. This still seems sticky long after it has dried, what do I use to stop this? Thanks for your help and all your information! Hi Erin, the gel mediums aren’t usually meant as a final layer so this would be why you have a sticky finish to the surface, depending on what medium you have used the surface will become less sticky with time. Hi Linda, not ideally because of the shiny finish of the varnish and the lack of adhesion of the paint onto the surface. If the spray was applied lightly you might be able to do it but the paint handling will be very slippy. I am playing with the idea of stained glass effect by mixing a medium into acrylic paint. Which medium should I use to get full transparency with acrylics? Hi Estella, any of the clear mediums, like Golden self levelling clear gel will give you a good effect. Would delta ceramcoat’s gel stain medium work for transparent effects? I am using the Gelli Arts gelli plate. Hi Jennifer, I haven’t personally used the delta ceramcoat medium, but looks like its designed for transparent stain effects. I have a picture has some texture, looks like painting but it is not. I want to add more texture and I have been told I can use liquitex moulding paste over pictures with painting brush. is this correct? I don’t want to change the color. I don’t want to add any color to whatever I use. Hi Semira, yes you can add a moudling paste to add texture to the paint surface. The colour of the paste will dependent on the brand you use, but most are white. Thank you for the info. I want to use moulding paste gel , not adding any color! Can I or better ask is there any moulding paste with no color? I don’t want to change my picture’s color. It is look like painting but it is not, just need to add more texture to the picture, to be able to make it like a real painting?? Hi Semira, yes you just need to use a clear gel. Hi Will, if you have some very liquidy acrylics and want them to be more solid, like the heavy body ones you use would you choose a regular gel, a high solid or a heavy gel? Hi Kim, the regular gel is the closest to the standard heavy body acrylic, but of the acrylics you’re mixing are very thin you’d be better off using the heavy gel. I know people tell you this all the time, but again thank you for this website. It’s amazing. I am trying to do a portrait using acrylic paint. I’ve been reading and looking at all the different golden mediums there are to offer. I wasn’t sure of the difference between polymer gloss medium and the soft gel gloss, or if I should use both? What would you reccomend for a more intricate portrait? And something to seal off the painting as well. I am new to using acrylics, it has been a long time but I do plan on practicing before going for the portrait. Hi Ashley, pleased you’ve been finding the lessons helpful, the glazing liquid gloss is a good medium for finer line work and more subtle glazes, and the soft gel gloss is used for an isolation coat for varnishing. I am trying to figure out what “technique” to use to make the painting look like it has smoke billowing and thin stringy lines throughout. If I send you a picture that has the “effects” that I am talking about, could you email me back with suggestions? I don’t know what type of tools or things around the house to use, to create that effect. (I can’t add an attachment to this comment, so I would need to know where to email you with the attachment. Hi Sheryl, if you paint with a translucent white such as zinc white it will give you that smokey effect. Hi I am searching for some advice and can’t seem to find it anywhere. I see everywhere it says to mix gels and mediums with the paint and then use it to add texture to the painting. But what I want is to add texture to the finished painting. I have an abstract all finished and I want to add a layer of clear something that I can make twirls or use a pallet knife to make some 3D effects and make it textured so that it is a textured clear layer over the finished painting. I have no idea which product to use. I really would appreciate your advice. Hi Chris, you just need to use a clear gel, such as these from Golden paints, the amount of texture and stiffness you’d like varies depending on the gel you use, soft gel being the softest and Extra Heavy Gels being the stiffest. Just paint it straight on, swirl with a pallet knife and you’ll be away! Thank you sooooo much for your reply. I’m extremely grateful to you for taking the time to give me your advice. Massive help. I would like to do some detailed linework with sakura micron archival pens onto white fabric lampshades and possibly wood. I figured I will have the problem of bleed and am researching ways to seal the material whilst giving a smooth but natural surface for the linework without gumming up my pens. Am I right in thinking that using GOLDEN Soft Gel Matte will solve this? I can see how much time you have spent replying to queries, there are so many and I may well have missed this information, so apologies if you have already answered this above. Hi Tammy, the Gel shouldn’t gum up your pens, but sometimes can lead to bleed when applied, even with archival pens. I use the Micron pens myself but haven’t personally tried a Golden gel over the top. The best thing to do would be to try a test sample, the matte gel will slightly lighten the dark on the pen due to the matting agent used in the gel being white, but I wouldn’t want to give you a definite yes about them bleeding due to not personally testing them. That’s the best way to go Tammy, it’s a really useful gel, both for applying an isolation coat and for extending the paints, pleased you’ve been finding the site helpful. Hi, do you suggest to dilute paint with water or soft gel, which one you recommend ? Hi Fran, I’d usually just use water to start with so the canvas absorbs the wash, but then might include a gel later on in the painting to add texture or change the consistency of the paint alongside the water. I’ve worked with a fair bit of acrylics and mediums. One I love but still have some difficulty with is self-levelling gel. Do you know of a trick to getting a consistent smooth coverage on large stretched canvasses (app 4’x6′ and up)? No matter how I’ve applied it (how much/how little, back supports, quick troweling/spreading, etc) it seems to never settle to an even level. Sometimes there will be small pocks or slight pooling or overlaps….I’m hoping there is a way to apply it that is not so stressful and produces an soft even thick gloss. Hi Lori, have you managed to create the effect you’re after with a self levelling gel on a small scale? It can be tricky to get that even gloss/glass-like finish on such a large scale, but if the gel achieves the effect on a smaller piece it gives you room to test consistency and flow/levelling properties. Hi Will, I am using Liquitex gel medium for decoupage. I am using it as an adhesive and also as a top coat sealer. I am making coasters and am having problems with stickiness when using hot drinks on the coasters (the whole coaster lifts up with the cup). I have been experimenting with drying times in an attempt to find a good formula. I have also used a polyurethane varnish as well as the gel for a final coat to see if that would provide a more robust finish. There must be a reliable way of doing this? Any tips would be really appreciated. Thank you. Hi Jean, I’ve used polyurethane varnish before on painted tables and have found it a good robust varnish. Gel mediums can still keep a little bit soft in comparison to a harder varnish, so a polyurethane will always be more hardwearing. I am new to painting but am endeavoring in a project of a grand scale. I’ve taken my drawing abilities and transferred them to canvas and am painting a rose on a 18×24 canvas for my wife. Very intimidating, but it is turning out beautifully if I may say so. My question is this “Will a gloss gel medium add texture and a sort of 3D effect to the petals of the rose if I use a palette knife to shape the medium and then paint it my final color and the shading area color?” Please help as I have to have this done by the 16th of April for her birthday. Thank you so much in advance. Hi Toby, Yes, if you use a heavy gel or even a Molding paste gel you will be able to add texture and then paint ontop with the same colours. Hope your wife likes her painting! I am so glad to have come across your site. I am working on an abstract right now in which I want to create a “dripping” effect with the paint. What medium would be the best to use in order to achieve this effect? Hi Kelsey,’Tar Gel’ has a nice dripping effect quality. You can see it in this video around the 50 second mark. Hi Will, I live in rural Australia and can only buy art products via the web. 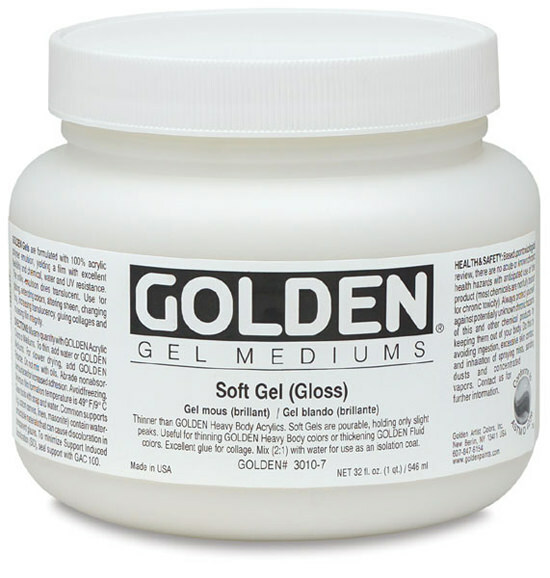 On the au website for Golden products it lists both ‘extra heavy gel’ and ‘extra heavy gel/molding paste.’ Can you please explain the difference? Pastes are essentially the same as gels, just with ingredients added to make them opaque. Gels dry translucent or transparent. Pastes will act more like a white when colours are mixed into them. You might find this video helpful that looks at the difference between Golden Gels and Pastes. Hello and thank you very much for this website and for taking time to answer questions. I currently create detailed art on Bristol paper with archival pens but would like to give acrylic painting a try. My artwork is geometrical, detailed and lines have to be very precise with no bleed. I have bought a primed canvas. What product do you recommend I use to achieve perfect lines/shapes? Hi Veronica, I would use a masking tape for getting sharp edges, and a smooth painting surface that mimics the Bristol board. You might find working on a very smooth primed board might suit your style. Do you suggest using any gel medium to paint on canvas though? Hi Veronica, the choice of gels depends on the final look and feel you’re after, what was the effect you’re trying to achieve? I want smooth lines that don’t have texture. Hi Veronica, I would use a smooth surface and a soft brush such as a sable, you could dilute just with water, or use a pre-thinned paint such as ‘fluid acrylic’ or ‘high flow acrylics’ for more ink like effects. Hi I have just finished a painting with moulding paste and that I painted acrylic over the top light moulding paste .do I have to varnish it after . Thank you for the useful information you provide on your website. I do collages on canvas painted with acrylic (as background). I read somewhere that an acrylic matt medium or a gloss gel medium is an effective way of gluing paper on acrylic. At the art store, I was recommended the Atelier Traditional regular gel (gloss), a gel painting medium. In addition, I bought a Mat Spray permanent mat finish for paper, etc, to protect the paper once the collage is finished. Did I make the right purchases? Or do you have a better recommendation? Hi Mahar, most gels can also be used as glues for paper so the regular gel you’ve got should work fine. I’m just getting into acrylics and really enjoying your site. I have two effects I would like to create: (1) a water colour type wash for a background. I read that using too much water destabilises the paint. Should I use Flow Enhancer for this? (2) I would like to add some texture so that some of my picture looks like oil paint i.e. thicker with a little relief/texture to it. What do you suggest for this? Many thanks! (1) a water colour type wash for a background. Either you can use an acrylic that has already been thinned in the manufacturing process such as high flow acrylics or fluid acrylics, or use a flow release to give you a staining effect with heavy body paints. Any thin medium such as high flow medium would also work and if you’re using an absorbent ground just diluting with water will work. You can add texture with any of the gels, the heavy gels are good for more solid sculptural texture. Thank you so much :-) Can’t wait to try it. I am trying to do a wet on wet watercolour grounding for a pastel painting (hard pastels). I am using a 300lb water colour paper. There is so much advice on surfaces that I am really confused. What would you recommend, Fine pumice gel? if so would you apply after stretching the paper or would you use some other medium? The textural quality of Acrylic Ground for Pastels is similar to other GOLDEN Gels including the Pumice Gels. The grit size lies somewhere between GOLDEN Fine and Coarse Pumice Gels. Is there any gill to make a thin paint (like Liquitex Basics Acrylic ) thicker ? I also wondering if Liquitex Basics Acrylic is already heavy body type . Hi Jahangir, yes you could add a heavy gel to the Liquitex basic to make it thicker, but adding the gel would make the paint less opaque. The Liquitex is a heavy body type acrylic, it’s slightly softer than Golden but can be a really nice texture to paint with. I would like to thank you for offering these videos I so desperately needed. I do have a question I am a painter and sculptor so many of my paintings have become more dimensional. I enjoy using different mediums to obtain the desired look for a piece I create. I would like to use something that will give my paintings a glass-like coating I know if I use crystal clear resin it will turn yellow in time… so what can I use to get the same effect yet keep that glass like look on my acrylic paints and or different mediums I use. Hi Jewel, lots of coats of high gloss varnish, spray varnish works best, would give you a glass like finish – as if the painting is within the glass. THANK U WILL!!! I WILL FOLLOW THROUGH AND TAKE SOME PICS OF MY WORK…THANK U THANK U THANK U!!!! Hi, I work on gourds. When creating flowers, I have found they look so flat and thought that maybe this might be the answer for creating a flower with more dimension. Wood this work on a gourd if I use gesso for grip? Hi Brenda, I can’t see why it wouldn’t work it, it would be a case of trying with the gesso and seeing how the paint adheres to the surface, should work well though. I was wondering why when I use the glossy gel it leaves my art work sticky. I am working on a journal and my pages are getting stuck together! What do I do? Hi Desi, glossy gel will often have a slight stickiness to the surface as it dries, it isn’t the best choice for in-between journal pages, you might find this article helpful on varnishing journal pages. Love your site, your courses….ready to dive into Portraits in Acrylic in the coming days. Do you use retarder in your water spray at all? In fact I don’t even recall you spraying your paints to keep them wet during painting. Do you? I live in Northern California where it is dry and hot, so acrylics continue to be a challenge to work with, but since I am deathly allergic to oil paints, acrylic is my medium of choice, and do love their versatility. Thanks! Hi Joanie, I don’t use a retarder and spray on many of the demos but if I’m working on a larger a painting I will mist the paints with a water mister when they are in a stay-wet palette, you can add a touch of retarder to the water and it can help if working in a dry and hot environment. I’ve been reading that I can use gel medium to glue glass/mirror to canvas. Is that true? If it’s true, what gel medium can I use to glue glass/mirror to canvas? Hi Tania, you can use gel medium to stick paper and card and if the mirrored surface is light enough it would also stick, but usually with the gel you paint it over the paper surface so it really holds it well. I haven’t personally applied glass to a canvas surface, but would use an epoxy glue rather than a gel as the back of glass is non-porous so you want a really good bond so it doesn’t fall off the surface with the movement of the canvas. I have painted a three-canvas painting of the ship harbor in Duluth, MN. It ended up being a little cool looking. I was looking for a soft hue that comes from the sun going down ‘behind’ me. Can I mix a tiny bit of color in the gloss medium I am using for the finish on the whole painting? Hi Lynnette, yes that would work, I often use a glazing medium for adding thinner glazes of colour due to the more fluid nature of the medium, but a gloss medium with a tiny touch of water would also work well. I have always painted water colors but am now trying to use acrylics. I am painting a picture of a church and it has a reflection in water. A lady at Hobby Lobby told me to use gloss gel medium to get the perfect reflection but I have no idea how to use this with the paint. I bought a tube of the gel but it does not have any directions on the use of the gloss gel medium. Can you help me with this? Hi Danny, you can just mix in the gel with the paint and it will dry with a glossy finish, you can see a demo in the video above how I mix in a regular gel, it’s exactly the same principle just the gloss gel will have a more reflective, glossy finish. I have sculpted a white marble lying polar bear, about 10″ long. I would like to install him on a base that will look like ice: shiny, translucent with a greenish glow. I’m thinking of using something like a flat rock, coated with a thick layer of gel that will give me the right shape and the ice effect. Can you suggest what material I could use, and how? Thank you very much, this is an excellent site! Hi Simon, sounds like an amazing piece, Heavy molding paste from Golden paints can be shaped into hard shapes that can then be carved by hand when dry. You can mix in paint to the molding paste to give the green effect, but the surface texture would be satin. The high solid gels have a high gloss finish and have very little shrinkage so could be poured over the top of the heavy molding paste so you have a satin inner that could be carved and then a shiny gloss outer. thank you very much, Will, for the prompt and specific answer. I have a quick follow-up question: can I mix some crushed glass into the solid gel to get ice-crystals effect? Glass Bead (L-R) and Clear Granular Gel are coarse textured mediums with a viscosity similar to Heavy Body that holds peaks. Made with genuine glass beads roughly the size of poppy seeds or clear acrylic granules with a consistency similar to coarse sea salt. The visual effect of these gels is like condensation on cold glass as they create a textured but glossy surface over color, and will appear similar to our Coarse or Extra Coarse Pumice Gels when enough color is added to hide their transparency. Thought the ‘visual effect is like condensation on cold glass‘ might be of interest. I have heard spraying the paint on your palette with a mixture of water and retarder helps keep paint workable longer…do you recommend, and if so, at what ratio? Yes, you can mix retarder and water to spray onto your paints. When using retarder it’s better used sparingly that too much as it doesn’t contain any binding agents. If using just retarder and paints it’s not usually recommended to exceed 15% (1:6) but if you’re just misting over the top it should be fine. Hi Judy, I would go for a satin finish, that would give you a nice sheen, but also give a uniformity to the piece. You can apply the layers with the soft gel gloss and then add a final finishing layer of satin varnish to unify the look. Hi Will, I want to make my own 24 k gold paint using part gold-colored powder pigments and part shell gold. I will be painting portions of small bronze statues. I tried mixing the powder with varnish and it was too runny and the “paint” was not uniformly pigmented. It didn’t cover the metal uniformly either. I am wondering if soft gel medium or regular gel medium would be better. Any advice? Thank you! 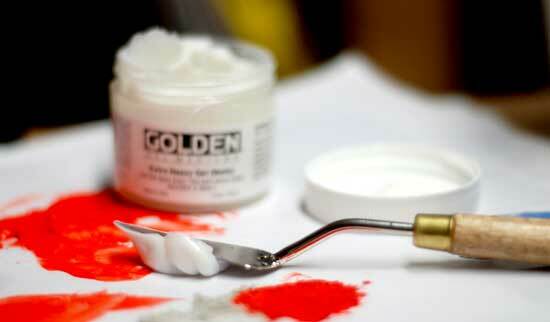 Hi Debbie, out of interest have you tries any of the golden paints from Golden? I’ve found the colours very good and you could easily mix in extra gold power/shell gold into the already existing pigment. Regular gel medium would be the closest to the binder used in heavy body acrylics. Thank you. I read that mixing real gold into paint essentially paints the real gold flecks so I have been reluctant to try that. It sorta makes sense. Just hate to waste real gold trying it out because of the cost. Btw…your videos have been VERY helpful. I am more of a mixed media girl and having to learn things about paints and mediums has been daunting. Pleased to hear it Debbie. Hi Peggy, you could apply the photos with a gel and mod podge, yu might find this video helpful about creating wooden picture transfer images. Please help, I am looking for a material that would offer an iridescent effect also using acrylic on canvas. Maybe a diamond/glitter ethereal affect I hope to achieve. Hi Rachel, you might like the Golden paints Iridescent colours that give an iridescent effect depending on which angle you view then from. Hi Lynda, nice to hear from you. You can use a self-levelling gel such as ‘Self Leveling Clear Gel‘ from Golden paints which you can pour over the surface. You can also use a standard spray gloss varnish to build up 20 – 30 layers to give a glass-like finish, although this method can be quite delicate due to the brittleness of the varnish layer. Hi will I am currently working on a portrait underpainting using system 3acrylic raw umber using thin glazes of water .what I have noticed is that the pigment has separated in the water making the paint look very grainy . Could this be due to the cheapness of the pigment itself .? Should I opt for artist range .? After watching your videos on mediums I think I may give the glazing liquid a shot .! Many thanks . Hi Dan, yes, the student grade paint is the issue. Glazing liquid is a great medium to use. Just one question. I hard a painter say that if you mix a little liquitex gel medium and some water in a spray bottle it’ll help keep the paint fresh while working. Can anyone tell me if that’s true and what specific product to use. Hi Stephen, to make the paints stay wetter for longer you can mist them with water (acrylics dry by evaporation – see: What are your paints made from?) or add a little retarder gel into your water to give you slightly more time. I’m new to mediums and gels and your explanations are great. But I’m still not sure what to use in order to achieve what I want; which is basically a dripping effect, but the mixture has to be consistent enough so it doesn’t run out of the canvas, like a 3d dripping. Oh, I forgot to add that the drops range from thin to robust. So I face some other issues such as splattering at the end of the drop and crazing. For the latter one, I read that GAC800 is a good product. Do you agree? Your advice would be very much appreciated! Hi Guili, nice to hear from you, the ‘tar gel‘ will give you a nice dripping effect. yes, GAC800 is a good choice to reduce crazing. Thanks for the fast response and the reccomendation on the tar gel. From what the video shows, it seems like the best option so far. Now, how much of GAC should I put into the mixture? I’m now following you page and have bookmarked it for references for future projects! Hi Guili, there should be directions on the GAC800 for dilution rates. Hi, pretty please with cherries on top can you help! which one do I actually need?! Hi Helen, it all depends on the final effect you’re trying to achieve, if you’re dripping/pouring, or building up thicker areas. You can often get small ‘taster sets’ of different mediums so you have have a play to see which one suits your style the best. I want to glue a few small metal items to an acrylic painting. What kind of glue should I use? Hi Elsie, using an acrylic paste glue like Araldite Crystal Fix would work. I created a skin of 3 layers of soft gel gloss on a printout of text (flipped, of course), let it dry and applied it to my collage. Forty-eight hours later, I don’t like the effect and want to remove this. Is there a clean way to do so? Have been trying wetting the area with a warm, damp cloth then scratching at it and sanding it, rubbing at it. Bits of the skin come up, but not much. Hi Carol, the soft gel usually sets on quite hard, I haven’t personally tried removing from a collage as it’s often used as a glue for collaging papers together. You could try Golden Technical Support who would have more specifics for this particular case. Hi Nicole, yes, a thin wash of the colour and then the colour mixed into the gel can help to give you a good level of saturation and vivid colour. Sometimes with stronger colours like blues and reds they will work fine just mixed into the gel but it can be harder to get a good coverage if using student grade yellow paints. I was wondering if I can apply gel medium to an acrylic painting after is has dried to further embellish the brush strokes, making them more pronounced, the way they are often added to a digital photo? If it can be done, to reduce the stickiness afterward of the gel medium, should I seal/varnish it, or just let it be? Hi Shawn, yes you can add texture with gels ontop of a dried painting and then finish with a varnish. Hi Ria, I wouldn’t personally use a water soluble medium under an oil painting as the thinners used with the oil painting will disturb the underlying layer. I am doing a Frank Lloyd Wright’s leaded glass painting (72wx24h) in watercolor using a 300lb paper. What’s the best way to achieve the semi-gloss beveled lead look for the lines? Will a thickening gel help? Hi Manvi, you could use a gel, the main issue would be in creating an even, smooth application if you wanted a raised texture. If you wanted the semi-gloss sheen without the raised texture you could paint over just the lines with a semi-gloss gel. My golden gel mediums is dried and evaporated. Is there any ways to reactivated it back? Thanks. Not that I’m aware of Biggie. I have a group of youngsters, wanting to experiment with painting in the style of Van Gogh, lots of texture. 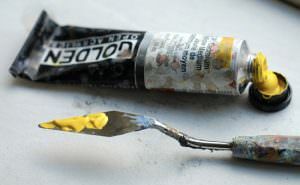 Rather than spending a bit on mediums to thicken a medium body acrylic, would mixing Tacky Glue or wood glue be appropriate, for the budding artists? Hi Tressa, you could use an artist quality PVA and mix with plaster (that you’d use at home for wall repairs), then you can change the ratio of PVA to make it more flexible, but too much PVA can give a shiny surface for the subsequent paint layers to adhere to. You might find this video of interest if you’re working onto a hard surface and working with kids it might be good fun to mix your own paste like the one in this video. Hope the Van Gogh’s go well! Hi Will you are so knowledgeable. I have a question: I have been painting with a palette knife textured flowers using heavy gel gloss mixed with modeling paste. All looks nice and moist and beautiful. 2 days later my paintings look too dry and faded. Do you think painting glazing liquid gloss on top will restore the sheen. Hi Nada, I would usually restore the sheen and saturation to a painting in the final varnish layer. Hey Will, Hope you’re doing well. I have a couple of questions, I baught a print on canvas online and it looks nice but as you know it will always look more like a photograph so i wanna make it in a way looks hand made and alive , They told me i should use Acrylic GEL MEDIUM and after reading a lot about it i’v found a good brand available here in spain called “Liquitex” … now to the questions. Which type should i use, the Gloss or Matte ? And can i mix both types and get a good more realistic result like smi-gloss/semi-matte or mixing is not a good idea !! Hi Sam, yes, you can mix the Gloss and Matte together to create a satin. I’d hold the print up to the light and see how shiny it is in relation to a couple of swatches of the gloss and matte gels, then you can match the sheen so your textures blends in. I have a couple of pre-primed box canvasses. Would adding a layer of Golden soft gel (matte) medium seal the canvas before painting and also give a smoother surface for painting fine lines, etc? Hi Patricia, to get a smoother surface you can paint thin layers of acrylic gesso on top and then lightly sand with a fine grit sandpaper. The smoother the surface you’re after, the more layers and finer grit paper so there is no visible canvas weave. The matte medium will create a resist so the further layers of paint won’t adhere or ‘grab’ to the surface as well. Hi Kiran, pleased you’ve been finding the videos helpful, yes you can intermix gels and mediums to try and create the perfect flow. 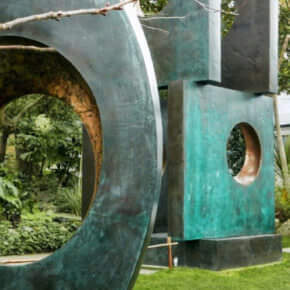 Fluidity without spread is a tricky one, as the effect is often achieved using resins, which have a resin and a hardener that have to be mixed together. You can add clear tar gel (from golden paints) into gels and it will help as a leveller. Someone gave me a jar of Golden Regular Gel medium, but it is dried out. Is there any way to reconstitute it or should I just toss it out? Hi Valerie, if it’s gone solid there isn’t anyway of revitalising it. I am curious if transparent airbrush medium can be used in place of pouring medium to do fluid art? I can’t find ingredients to either to know how similar they are. I know the pouring medium leaves a gloss finish, which I don’t really care about, I just want a medium to extend a little paint into a lot of paint and be able to pour it onto my canvas. Some people are using PVA glue, but I worry about the longevity of that. Do you have any thoughts? Thanks so much! Hi Crystal, yes, you can use airbrush medium as an extender, or even work with fluid or high flow colours that come premixed into a fluid form. Hello ! I was wondering if you knew if the golden artist color heavy gel would be safe to put in the oven to dry ? I plan to paint a glass shot glass then put it in the oven to set. I want to mix my paints with the gel to add some texture, I’m just not sure if it would be alright in the oven and I don’t want to mess up. Please and thank you ! Hi Lucia, I would use paints specific for glass painting for anything going into the oven, but you can contact the Golden technical department to double check. I have been using the “Liquitex- gloss heavy gel” for collage. I used this process: paint the surface with the heavy gel, place the paper on top, paint over the paper, leave, and rub off with a damp cloth. However, when I rub off with the damp cloth all of the paper comes off. Is there a specific reason this may be or something you could suggest? Hi Jess, if the paper is wet it will rub off and not adhere, you could try adding the paper onto a more textured support like a raw canvas as this would grab the paper more than an acrylic gel. Hi Nancy, you can thin the paint with a glazing liquid or use a transparent pigment. Most artist quality paints will show the level of opacity or transparency on the paint tube. I want to embed plant material into acrylic paint, onto canvas and then also paint over it. Wild plants, hay, things that are as much as 1 inch thick. Any suggestions of what medium to use and how? (I don’t wish to embed them in a uniform strata of gel, but almost a coating that will preserve them into a canvas but let me paint on and around them. Suggestion on how to experiment and with what? Hi Ziv, you can use a soft gel gloss, of regular gel, you might find this video of interest using golden gels as an adhesive. I am painting a beach scene and want to add sand texture to the acrylic paints that I am using for the sand. I have some actual beach sand that I got yo adhere to the painting. How can I adhere it? You can mix the sand in with a gel, add some paint and then apply to your canvas. Thank you very much for sharing this information, it’s very useful. This all is soooo informative. A big thanks for the article. I am a self taught artist. Since yesterday,I have been trying to find out ihow to do palette knife painting. This will be my first try so don’t wanna spend money on heavy body acrylics which I think are a must for palette knife. Can I mix heavy gel medium to my normal acrylics so that it holds the shape ? Thanks a lot. I appreciate that you take out time to answer all the questions. Hey Manu, nice to hear from you, yes you can mix heavy body acrylics with a heavy gel to hold its shape, it can work brilliantly with palette knife painting. 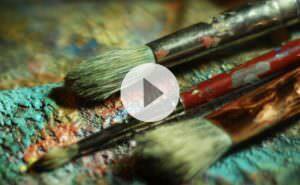 You might find this palette knife tutorial of interest to get you started. I had a question regarding using mediums . I am attempting to paint on wood using a medium (heavy gel) can I apply this to the wood allow it to dry and then proceed painting . By doing so would it just create texture to the entire piece ? Or must I first mix the gel with my paints then begin ? Hope my question was clear and precise ! Hi Leigh, when working with gels you can either apply the gel first to create texture and then paint on top or mix with the acrylics and then paint with that. I find even if you add a little paint into tine the gel it can help with judging the next layers of the painting. I have been studying your material (thanks) on acrylic mediums/gels. A couple of questions, please. 1) I’d like to try the regular gel – just because I tend to use a lot of paint and hoping this will extend my paints and make them go further. I am confused on whether to go for the semi-gloss or gloss finish. I like to see richness of colours in my paintings – so does this mean that the gloss (rather than semi gloss) would be better for me to try? 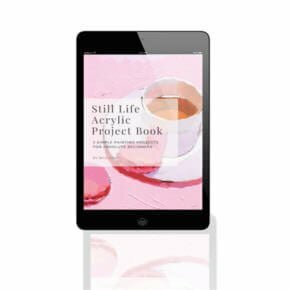 2) Reading and listening to your material on this – i was then thinking that the surface of an acrylic painting will be patchy in terms of glossy and not so glossy areas. I had already noticed this in my work through using different brands of acrylic paint (i have Golden, Liquitex and W&N). But you say the soft gel (gloss) applied as an isolation coat pulls the painting together to the same degree of glossiness. If I am framing an acrylic painting – do I apply the isolation coat (without varnish) and then frame? Or is the isolation coat not necessary? I am confused on whether to go for the semi-gloss or gloss finish. I like to see richness of colours in my paintings – so does this mean that the gloss (rather than semi-gloss) would be better for me to try? Yes, the gloss would give you more richness and saturation to the paint. But you say the soft gel (gloss) applied as an isolation coat pulls the painting together to the same degree of glossiness. Yes, that’s right. Imagine the isolation coat as a clear sheet of glossy film, whatever it is laid on top of will appear glossy. You can then judge the over aesthetic of your painting and decide if you want to keep with the gloss finish (and apply a gloss varnish) or use a semi-gloss or matte varnish. It’s a personal choice, if you want to have a removable varnish layer then you would need an isolation coat. If you want a permanent varnish layer you don’t need an isolation coat. Many thanks Will – that’s great. I’ll have a read up on varnishing too. Hi I am trying to paint on both wood and glass surfaces, then give it a thick clear top and then paint again over it to create a 3 d effect. what mediums would be the best to use and how would I use them? Would they allow the second or third layers to cast shadows? Hi Danielle, liquitex pouring medium can give you a great shiny top coat. 1.) if I mix soft gel gloss with my paint (heavy body acrylic) and paint the under coat, what is the ratio of soft gel gloss to paint? As from what I understand, this will extend my paint color with out thinning the paint too much, is that correct? 2.) Before this dries, should I have my top (lighter color layer) mixed which, I think should be Titanium white (heavy body) mixed with either high solid gel gloss, or extra heavy gel gloss. Which would you suggest? And what ratio of paint to gloss would you recommend? From what I can tell from the photo I have of the painting, I think the top color was poured on somehow and then an implement was dragged through to create the mixing of the light and dark paints, however, I am not sure how to execute this plan with acrylics, as they do dry quickly, much quicker than oils and so I don’t know if you can add a retarder to the paints or if I should just go for it. I am going to experiment first with a small canvas, 20″ x 30″ however, the large canvas that I intend to paint in this fashion is 60″ by 72″ so I must have my technique down. I wish I could send you the photo so you could see what I am trying to attempt. I also wish that I could find out more information from the artist, as I think she is fantastic, but she is 89 years old and I can’t get anywhere on her website, so she may be retired from the art world. I would buy one of her paintings in an instant if the cost wasn’t astronomical. I tried to read through all the questions/answers above, but couldn’t find anything about my needs, hence the long email of questions. Thank you in advance for your help, and any information you can provide will be greatly appreciated. Nice to hear from you, and pleased you’ve been enjoying the website. 1) you can use the gel in any ratio, its just getting a balance between the opacity (more paint) or the coverage (more gel). I’d start with 1:1 and see how it feels for the effect you’re after. Hi Sandi, you can add a gloss gel or a gloss varnish to the surface to bring up the sheen. I have OPEN gel gloss and is it possible to use it as an isolation coat and finish it with a semi – gloss top coat? Hi Silvia, I personally haven’t tried it but would imagine it would have a longer drying time, you could ask Golden technical department to be sure. Love your article and tutorials. My question is: what’s the best gel/medium to permanently adhere a clear transparency that has been painted on to a wood panel (that has also been painted on) smoothly and still look clear? I have tried SO MANY and they either buckle or peel away. Thanks! Hi Tiff, when you say ‘clear transparency’ what exactly is the material? if its an acetate then a spray glue will probably be the best option to give a solid adhesion. Hi Kacey, mmm, I’m not sure why the heavy gloss medium is leaving behind the spots. The change in viscosity can sometimes happen when adding too much retarding medium (which can give the paints a gummy feel) but I haven’t heard of it with the heavy gloss. I would test on a couple of different surfaces just to see if there is a residue on the canvas that is being disturbed, let me know what you find out.